Now that we have defined our most fundamental Natural Right and we have extrapolated out to cover additional rights in connection to this most fundamental right, we need to determine the boundaries of these extrapolated rights. Using what we have already deduced, we need to determine how far they extend and where they must end. I start with something I call a “rights bubble.” Think of this as a bubble that extends around your Natural Rights: your free will, your life, your body, your labor and all the property necessary to sustain your life that you have used your labor to gather or create. Because it defines you as an individual, you are the only person who can lay just a claim to your free will. For the same reason, you are the only one who can make a just claim on your life, your body and your labor. This includes all of the property you necessary to sustain your life and exercise your will which you acquire or create through your labor. 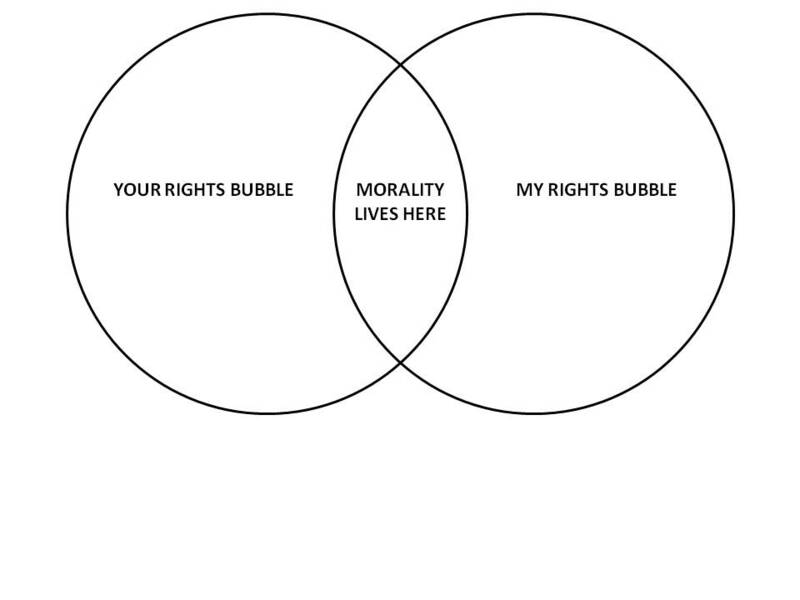 Your rights bubble is an imaginary bubble that extends out and encompasses all of these extensions of your Natural Right to your free will. You are the sole owner and authority over all of those things that lie within your rights bubble. They are yours simply because you exist, and you are the only person who can make a just claim to them or decide how they should be used. Now, this illustration works well as long as we imagine we are the only person on a deserted island, but what happens when we introduce another person? If you will remember my earlier example that explains how, by using my labor to make a hoe, then using the hoe to grow a pineapple, I have created a Natural Right to the pineapple. I used my labor to create a tool and my labor to grow the pineapple which I need to sustain my life, so I am the only person who has a just claim on that pineapple. But what happens if another person is marooned on the island with me? Do they have a Natural Right to eat that pineapple so they can sustain their life? The answer is no! This is the point where most people start to see “gray,” but there is no gray in Natural Law. Under Natural Law, the pineapple belongs to me because I used my labor to acquire it so I can sustain my life. Now, while I may choose to share it, or, if I have enough, I may give it to you, I have no obligation to do so. In order for you to claim a right to my pineapple, you have to also claim a right to my labor, my body, my life and – ultimately – my free will. And that is where our Natural Rights end: at the point that we can trace a claim to something back to another person’s free will. This is why slavery is wrong: not just because you are claiming to own another person, but because you are claiming to own their free will. It is impossible for you to own that which you cannot possess or control. At best, all a slave master does is force his slave to use his body and labor as the master wishes, but, so long as the slave does not surrender his free will, the slave master does not actually possess or control that slave’s free will. We can extend this to other aspects of our society. When a person is forced to provide for the welfare of another, it is a violation of that person’s Natural Rights because – ultimately – it is a claim against their free will. Murder is the ultimate form of claiming a person’s free will as it ends their ability to sustain and exercise their will in this universe, but it is still a claim against the victim’s will and, thus, a violation of Natural Law. Our individual Natural Rights are derived from our Natural Right to our free will as granted to us by our Creator. Because the Creator is the source of our free will, we have a duty to protect and preserve the Natural Rights of other individuals. Natural Law, the universal moral law that governs this universe, is derived from the intersection of our Natural Rights and the needs of others. How we act toward one and other in relation to this conflict determines whether or not we are in accord with Natural Law. Are you asking for reblogging? I can do that. Anything else? Whatever those who read and like what I am trying to do here feel moved to do to help me spread the word about this little piece of cyber space is all I can or will ask? Part 4 of Joe’s excellent series on natural rights. Great explanation of Natural Rights! So would you say that Taxes are immoral and a fundamental breach of natural rights? Personal income taxes? yes. Taxation in general, applied equitably across all people? No. That would be in accord with the Natural Right to contract (i.e. the social contract). Great….I look forward to it. The exestripe shines through. Thanks for taking the time to answer.